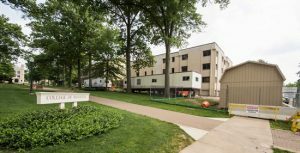 Faculty and staff have been relocated to temporary offices, the building has been emptied of its contents, fences are up, and construction trailers are in place. In just a few more weeks, the demolition of Mateer Hall will begin, clearing the way for construction of the Ruth W. Williams Hall of Life Science. Weblog authors are solely responsible for the content and accuracy of their weblogs, including opinions they express, and the College of Wooster, disclaims any and all liability for that content, its accuracy, and opinions it may contain. Williams Hall Project Updates. © 2019 All rights reserved.